Our first dog was Sam. He's no longer with us, but his progeny certainly are. They are all over the continent competing in shows, field trials, agility, working as therapy dogs, and being fantastic companions for their owners. Whatta guy. we miss him. As a kid, Geoff always wanted an apricot. Thanks to the kindness of our fellow Nova Scotian breeder Kathryn Diefenbach, we got one - Sassy, our matriarch. She hailed from Louisiana, a bayou belle. Alas, she too is now gone - Christmas morning, 2016. Sass and Sam were a fabulous pair. 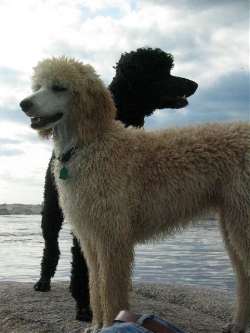 On their union we began to build our line of Leeward Standard Poodles. Leeward’s Pixel (Pix) at 6 months. Leeward’s Charlot (Charlot) at 6 months. In her day, the late Pix had 23 puppies, and Charlot, who's still with us, was a proud dad a few times himself with other people's dogs. One of his pups we got as a stud fee, the wonderful black Bijou (Classay Beaujolais), a bright penny indeed, and six days later here at home, Pixel's glorious white daughter, Georgia (aka Leeward's Buckwheat) was born. Now in their prime, Beeje and Georgia are inseparable buds, might as well be littermates. 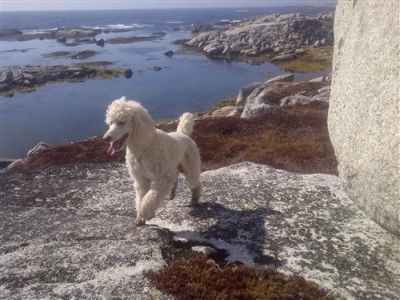 To enrich our genepool, inspired by Geoff's dad's dream of creating the perfect poodle, one that wins in the ring and the field, we imported from a Wisconsin breeder, Luna, and we bred her to Charlot - what a match. Luna had three litters, a litter of nine, and two singletons. Her last puppy we call the Great White Hope, Leeward's Ninja. Has there ever been a more gorgeous, biddable boy? Leeward's Ninja, the great white hope. What a beautiful dog. ...and from our 2017 litters, the most beautiful puppy I've ever see, Leeward's Ella Fitzgerald. We hope to breed her in 2019. Ella carries the Sassy-Pix-Georgia sweetness forward in spades. Just want to thank you both again for giving us such a great dog! It’s our one year anniversary today; she continues to be such an important presence in all our lives. The entire family and extended family have fallen totally in love. She is adored and cherished.